Sacred Site Explorer and Earth Mysteries Researcher. An ecologist at heart, he has devoted much of his life to preserving the world’s eco-systems through the development of organic agriculture in both Canada and the UK. His work with Rudolph Steiner’s Biodynamic philosophy provided the stimulus to explore more deeply into the interactions between the Earth and Cosmic forces. Drawing from a family history of master builders he inherited the craft skill of a stone mason and for over 30 years crafted structures and buildings across the world. Whilst his natural talent for design and landscaping developed he became aware of the acoustic qualities in specific rock formations, awakening a deep passion to study ancient sacred sites around the world. His travels inspired him to study the indigenous people and to experience initiations into Incan and Mayan cultures. It was whilst studying ancient calendars he connected with author and Mayan researcher Jose Arguelles and in 1992 Rob published the first U.K. addition of Jose’s new Thirteen Moon planetary calendar called ‘Dreamspell,” a cosmic view of time containing many of the mathematical time codes used by the Maya. 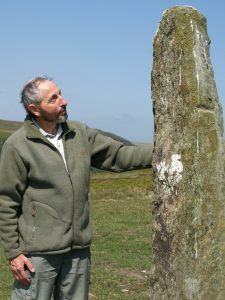 His ongoing quest to re-discover the wisdom of the ancients has embraced a broad spectrum of research including the Cosmic Origins of Mankind - Sacred Geometry - Crop Circles, and more recently - the Harmonic Resonance of Ancient Stone Structures. This rich tapestry of experience is woven into his skills as a researcher and creative film producer. In 2008 he launched a compilation of his work with the DVD Secrets in the Stones - Part One. He is currently working on the next two sequels. Copyright 2009 -2019 Robert J Underhill. All rights reserved.